Guides and Leaders are always looking for different activities to broaden their programs. This page will feature a range of activity resources that may be of interest. 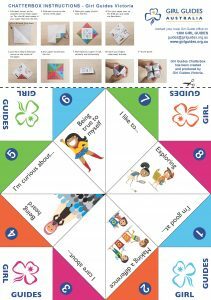 Have fun using the origami chatterbox created by Girl Guides Victoria. Printing it using a commercial printing company that requires bleed and trim marks. This booklet is designed to help you out when you are looking for inspiration of what to do in your Guide Unit for a term, or when you are busy and need some instant programs. All the programs are set out with a similar sequence – introductory game and ceremony/gathering, learning activity 1, patrol time, learning activity 2, active game, learning activity 3, quiet time, learning activity 4, game using learned skills, closing ceremony. For some programs, there are extra options as well.